A team of young mathematicians from Ashlands Primary School in Ilkley is celebrating coming top in the annual primary maths competition organised by The Grammar School at Leeds. The Year 6 pupils, Matthew Hall, Jamie Spiller, Tom Shaw and Elizabeth Francis were up against teams from 30 primary and prep schools in a closely fought final at Alwoodley Gates, Leeds. The youngsters had initially beaten off stiff competition from 80 West Yorkshire schools in the first round of the challenge, which is aimed at pupils in their final year at primary school. Runners-up were Fulneck School, Pudsey, with Menston Primary School, Ilkley , finishing in third place. “It was great to see so many talented children taking part and enjoying maths. The standard was extremely high with just 1 point separating the winning teams” said Mr Pat Brotherton, maths teacher at GSAL. 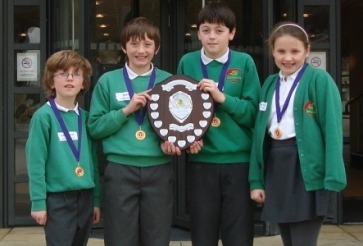 The winning team from Ashlands Primary School are (L-R) Matthew Hall, Jamie Spiller, Tom Shaw and Elizabeth Francis.